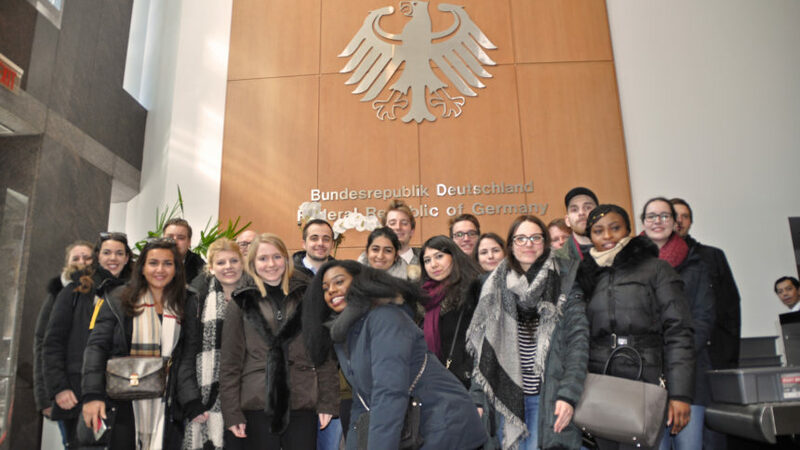 At the 17th of March the delegates were invited to the Permament Mission of Germany right next to the UN headquarter in New York City. Two days before the start of the National Model United Nations conference, Mr. Hessler, PR-reporting, was giving a lecture about the work of the permanent mission. Especially he was highlighting the concentrated work on the on-going campaign for Germany as a non-permanent member of the UN security council in the years 2019-2020. The decision on that will be in July 2018. The Federal Republic of Germany was holding the non-permant membership of the SC last time from 2011 to 2012. The government in Berlin has long argued for reform of the UN body and a permanent seat for itself. Afterwards the students had the opportunity to get some more information about the politicial behaviour of their assigned country, the Republic of Korea, and the work of the permanent mission in general, in an open question and answer part. Mr. Hessler was compliant to answer and explain the mentioned topics to the very interested students. Next → Next post: National Model United Nations 2017 is in session!